A surprise announcement this morning at The Beat 92.5: Morning man “Cousin” Vinny Barrucco will be leaving his job to pursue another opportunity. His last day is Friday. A months-long break might suggest a move to a competitor, which requires him to stay off the air for a while first (generally for three months). But there’s no obvious opening at Virgin Radio (which Barrucco left to join The Beat shortly after it launched in 2011) or CHOM. “I’ve been on the air for almost 15 years so I’m looking forward to taking a step back and enjoying quality time with my wife and newborn daughter,” Barrucco wrote in his Facebook post. Barrucco and wife Tina Oliveri had daughter Sia born in August. Numeris released its quarterly metered radio ratings today. There aren’t a lot of surprises, because it’s mostly the same numbers as the last time, and the time before that, and the time before that. So instead of just excitedly reposting the top-line numbers or fetching the various spins by the broadcasters that make everyone look like they had the best quarter, I thought I’d take a look at some historical data and see how the stations are trending over time. I did this exercise for Canada’s five metered markets for Cartt.ca after the last ratings book. If you’re a subscriber you can read them there: Vancouver, Edmonton and Calgary, Toronto and Montreal. In this post, I’ll go into some more detail about the Montreal numbers, with charts! Since 92.5 FM in Montreal became The Beat in 2011, the station has made much of its staff lineup by poaching personalities from direct competitor Virgin Radio. Cat Spencer, Vinny Barrucco and Nat Lauzon were hired directly from Virgin, and Nikki Balch and Rob Kemp also previously worked at 1717 René-Lévesque Blvd. (for Virgin and CHOM, respectively). 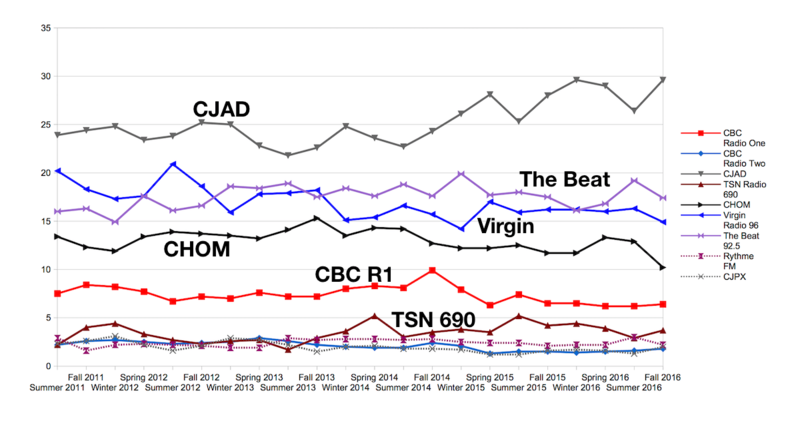 With The Beat’s ratings being solidly ahead of Virgin for what seems to be a sustainable period, it seemed it was only a matter of time before Bell Media hit back. This week we learned that it has poached from the top, hiring Martin Tremblay to lead the Énergie, Rouge FM and Virgin Radio Montreal stations. Tremblay was hired as interim program director at The Beat a year ago. Before that, he spent six years in what is basically the same job he’s now going back to, leading the Montreal French music stations and Virgin at Astral and then Bell Media. Helping RNC Media create a Rythme FM affiliate in Gatineau, which lasted two and a half years until RNC decided to rebrand it as WOW FM. Helping Attraction Radio turn CKRS-FM in Saguenay into another Rythme FM affiliate. Helping RNC Media turn CHOA-FM in Abitibi into yet another Rythme FM affiliate. Helping RNC transforming its struggling CKLX-FM into 91.9 Sports in Montreal, and later turning Capitale Rock 96.5 in Gatineau into a partial affiliate of it. While 91.9 Sports is going strong and RNC finally seems happy with that format, the Gatineau station has dropped sports programming and is now Pop 96.5. Launching Groupe Puissance Média, an ad sales group that works with both RNC Media and Cogeco Media TV and radio outlets in the Outaouais region. Work for Rogers’s Kiss 105.3 in Ottawa. Tremblay starts his new job Aug. 7. Like the on-air personalities who made the jump, he’s bound by the terms of a non-compete clause in his contract that prevents him from working for Bell Media right away. “So enjoying my free time,” he tells me. I asked Bell Media how this affects existing management at these stations. Mark Bergman is the current program director at VIrgin Radio. Will his role change? “We have no comments to make at this time,” was the response from Bell Media communications director Simon Céré. I also asked Bergman and Martin Spalding, who heads local TV and radio in Quebec, for comment, and will update this if I hear back. Meanwhile, the other three radio stations at Bell Media in Montreal will all come under the control of Chris Bury, currently the PD for CJAD and TSN 690. “As CHOM’s Assistant Program Director and Music Director, Picard will work directly with Chris,” notes a memo to staff. Bury’s expanded duties means that more will be delegated to CJAD/TSN 690 Assistant Program Director Mathew Wood, who takes on a larger role at TSN. These management changes took effect immediately when they were announced to staff earlier this week. CHOM has been without a program director since the death of André Lallier in 2015. Meanwhile, at The Beat, there are decisions to make. The station is led by general manager Luc Tremblay, who was also hired as head of digital strategy at Cogeco Media last June. Numeris, the company that measures radio and TV ratings, came out with their quarterly report this week, and once again it was Cogeco’s 92.5 The Beat that had the most good news to announce on the anglo side. Among anglophone listeners, CKBE-FM had a 17.2% audience share, second only to CJAD’s 28.2% among all listeners. Virgin Radio was well back at 13.5%. CHOM recovered a bit after hitting a new low in the last quarter. It’s still fourth among anglophone stations, but it regained its position as first among men 25-54. Despite this being a good report, The Beat couldn’t resist getting cute with spin, saying it’s the “number one radio station”, which only works if you (a) exclude the francophone market and (b) exclude people outside the 25-54 demographic. It also called its morning show the “fastest growing” one in the market with new hosts Vinny and Nikki. Which is kind of like saying your kid is “most improved.” The Beat’s morning show has been historically weak while its daytime has been strong. Bell’s press release stressed its combined market share (which is, of course, because it owns most of the stations). CJAD still has the highest share by far, and 8 of the 10 most listened-to shows among anglophones. TSN 690 is stable at a 4% share, and CBC Radio One climbed more than one and a half points, its total audience up about 25% among anglophones. On the franco side, unsurprisingly it was another win for 98,5fm, which once again declared itself the most listened-to radio station in all of Canada. Though its average minute audience of 37,300 (in its central market) is beat by Toronto’s CHFI-FM with 42,400. Bell Media’s press release couldn’t dig up much to say about Rouge FM, so it led with Énergie instead, noting its improvement. Rouge FM dropped 2.5 percentage points in market share from a year ago. Not that Rythme FM was much better. Though it’s still ahead of Rouge FM in the ratings, its share dropped to 16.3% from a high of 20.5% in the summer. Great news for Radio-Canada’s Première station, which after hitting a low of 6.6% this summer has hit a high of 13.4%, putting it third in the market. Radio-Canada’s press release notes that morning show Gravel le matin is second in the market, behind 98,5fm’s Paul Arcand. There were some winners on the low end of the ratings board as well. RNC Media’s 91.9 Sports, which went through a series of format changes — from jazz to right-wing talk to news talk and finally to sports — in an attempt to find an audience, seems to be happy with the sports talk format. It had a 2.1% share, which is 50% higher than the last ratings book, and an average-minute audience of 3,700 which just slightly edges Radio Classique. The boost was enough to warrant an article in the Journal de Montréal. Good news as well for CHRF AM 980, which more than doubled its share to 0.7%. Still dead last among music stations, but it’s an improvement. Community station CIBL, which started reporting for the first time last quarter, is still the lowest-rated station overall, with an average of 200 listeners in French and an English number within the margin of error of zero. The station looks like it’s going to stay here for the time being. Its new manager explained during a recent general assembly that they discovered Numeris offers lower prices for community stations. Numeris released its quarterly ratings report this week for Montreal and other metered markets. The Montreal top-line results show once again a significant margin between 92.5 The Beat (CKBE-FM) and Virgin Radio 95.9 (CJFM-FM). Other measured stations had shares under 1%. Once again, among overall anglophone audiences, CJAD is the clear winner with a 29.6% share, tied with last winter as its highest share in the past five years. The Beat clearly beats Virgin, up by two and a half points. It’s also ahead in the adults 25-54 demographic, which Virgin had a bit of an edge in historically. And even when counting in francophone audiences, The Beat is still ahead. CHOM, meanwhile, had its worst book in the past half-decade, dropping more than two points. Radio ratings share (Montreal anglophones, ages 2+). Data by Numeris. Click for larger version. CJAD is doing well, despite everyone’s opinions (usually negative here) about its programming. Since 2014, it has climbed into the 25-30% range, with noticeable dips in the summer, suggesting Montrealers are tuning in when there’s news. No individual programming change would explain this, though 2013 is when there was the last major reshuffling, getting rid of Ric Peterson. The Beat is winning the battle with Virgin. It took about two years after Q92 relaunched itself as The Beat for there to be real traction in the ratings, and a noticeable drop in Virgin’s share around 2013 led to The Beat taking the lead. Since the beginning of 2014, The Beat has led among anglo listeners, though the adults 25-54 demo has gone back and forth a bit. CHOM’s bad book could easily be an outlier, so we’ll have to see. As for TSN 690, a lot of people seem to be very concerned about their ratings (and, like with CJAD, very eager to blame problems on a particular on-air personality), but it’s about the same place it always is. The latest rating is slightly below where it was a year ago, and slightly above where it was two years ago at the same time of the season. CJAD sent out a press release noting their #1 status and adding that it is the best-rated news-talk radio station in Canada in terms of audience share in its central market. (The fact that Montreal has a limited number of English stations is a big factor in that, of course.) And it singled out hosts Andrew Carter (most listened-to radio show in the market), Aaron Rand (most popular afternoon show) and Ken Connors (a 52% share on weekend mornings). The Beat also sent out a press release, staking claim to the title of highest-rated music station in the market, as well as the adults 25-54 and women 25-54 demographics that advertisers love, and highlighting its high ratings during the 9-to-5 workday, which continues to be its strength. Virgin Radio didn’t send out a press release, though it did post messages on social media noting some ratings wins. It calls Freeway and Natasha “Montreal’s #1 most listened to morning show”, but only in the fine print do you realize they restricted the audience to adults 18-49. Another image pointed to the station having “more than 2 million listeners a week”, which is true, but that counts everyone who tuned in for even one minute during that week. It doesn’t measure how long or often people listen to the station, and The Beat has the same reach. Once again, news-talker 98.5 FM is the leader among all audiences, though Rythme FM declared victory in the adults 25-54 group. Radio-Canada bounced back big time from a bad book in the summer, taking third spot overall. CKOI’s rating is also noteworthy. After being stuck with shares around 6%, it’s now several points up on that. Meanwhile, Énergie, whose lineup includes Dominic Arpin, Mélanie Maynard and Éric Salvail, gets smaller audiences overall than Virgin and The Beat. Radio-Canada, which notes a 30% year-over-year increase (good news after a pretty bad report in the summer ratings). Bell Media, which highlights the success of Énergie’s afternoon network show Éric est les fantastiques. Because it’s carried on multiple stations, it gets a large audience. Also roundups from La Presse, InfoPresse and ActusMédias. CHRF 980 AM, which seems to have an actual programming strategy now, had its best ratings ever. Except it only started reporting ratings in the past year, and its share is 0.3% among francophones and 0.4% among anglophones, for about 800 average-minute listeners total. New on the ratings chart is CIBL-FM 101.5, the community station whose studios are at the corner of St-Laurent Blvd. and Ste-Catherine St. The station unsurprisingly scored zeros for anglophones, and starts on the francophone chart as a 0.1% share, 300 average listeners and an average daily reach of 16,800. The only station with a worse rating among francophones is TSN 690. It’s certainly not a win for them, but the ratings book should give them a lot of information about their audience that they didn’t have before. Following today’s publication of Numeris’ Summer 2016 results, The Beat 92.5 maintains its ranking as Montreal’s #1 Music Station! The Beat is not only the number one English-language music station among radio listeners of all ages, but it is now is now the Number one RADIO station in the most important demos, Adults 25-54 and Females 25-54! This was the beginning of a very self-congratulatory press release from 92.5 The Beat on Thursday after learning they had finally beaten competitor Virgin Radio 96 not only overall but among their key demographics. It’s good news for the station that on Tuesday celebrated its fifth anniversary. But we’ve seen this kind of surge from The Beat before, so it’s too early to tell if the tide has really turned. As readers of this blog are well aware, there are a lot of ways to play with ratings numbers to claim to be number one. In the case of The Beat, it means ignoring the French market entirely, and ignoring the top-rated English station in the market, CJAD. At which point you’re down to three commercial stations. Other stations have shares below 1%. AMA means average minute audience, the average number of people who will be tuning into a station during any minute of a 24-hour day. Daily reach refers to how many listeners will tune into a station for at least one minute during the average day. Comparisons to spring (Feb. 29-May 29) and last summer (June 1-Aug. 30, 2015) are here for reference. I’d pay more attention to the year-over-year change than the change over spring, since summer ratings tend to go down particularly for non-music stations. And don’t read too much into the percentage changes for stations lower on the chart. The higher margin for error exaggerates the amplitude of the changes. The Beat has reason to be happy, being higher among anglophones than it was both last spring and last summer. But the big win is in the adults 25-54 and women 25-54 demographics, which it had consistently lost to rival Virgin, even while it had a larger audience overall. “Today’s milestone results are the product of great teamwork and proof that our audience likes the changes we made to the schedule,” GM Luc Tremblay says in the press release. This is in reference to moving Cat Spencer to afternoons and Cousin Vinny to mornings, but left unsaid is that listener anger to the dropping of Kim Sullivan and Sarah Bartok hasn’t resulted in a drop in ratings. The Beat says its 25-54 audience for the morning show went up 35%. The news isn’t all bad for Virgin and Bell Media. Virgin’s audience is up among francophone listeners (though just like last summer it’s exactly tied with The Beat for audience among francophones), and CHOM has much more franco listeners. Plus, of course, Bell Media owns four of the five commercial stations in the market. More importantly, we’ve seen this before. During the winter of 2014-15, The Beat and Virgin had similar numbers relative to each other. The Beat’s program director said the station expected to continue to improve. Virgin’s said it was because it covered the Christmas period when The Beat does better with its Christmas music. The next ratings period, Virgin was back on top. The next ratings period will tell us if this was another fluke. But The Beat has been consistently higher than Virgin in the overall ratings, and this ratings period was as far from Christmas as you can get. CKOI is getting more respectable numbers than it used to. Not so long ago it was in the gutter, being outperformed by the anglo music stations among francophones. Now it’s well ahead of them, even nipping at the heels of #2 music station Rouge FM. We’ll see if that keeps up. 91.9 Sport is holding its own, with more than three times the audience it had last summer before the format change and equal to what it had in the spring (when presumably there was more sports to talk about). But its market share is still low, and it might need more to be viable as a talk station. CHRF, the station that was supposed to be Radio Fierté and is now airing easy-listening music and some miscellaneous programming, is still stuck within the margin of error. The Beat 92.5 is continuing its summer of transformation. On Monday morning, it announced that it’s moving Cat Spencer to afternoon drive and Cousin Vinny Barrucco to mornings. The changes take effect immediately. Vinny will be joined in the mornings by co-host Nikki Balch, who has returned to Montreal after leaving Virgin Radio two years ago, as well as Stuntman Sam and Kim Kieran on news and traffic. Kieran is also moving to mornings from afternoons, replacing the departing Natasha Hall. Spencer seemed excited about the change, even though morning host is traditionally the most prestigious of the radio jobs. (The 9-to-5 workday shifts are The Beat’s highest rated.) Spencer’s on-air time isn’t only reduced to two hours a day, but four days a week, Mondays to Thursdays. He’s joined by Claudia Marques on traffic. Spencer explained on the air that he had planned to do mornings for five years when he joined The Beat in 2011, and wanted to move to afternoon drive and have his mornings back. The rest of the schedule is unchanged. Donna Saker does 9am to 1pm, Christin Jerome does 1pm to 5pm, and Jeremy White takes over at 7pm. Rob Kemp and Nat Lauzon do weekend mornings and afternoons, respectively. The changes (which also include new headshots for everyone) come less than two months after The Beat brought in a new station manager, Luc Tremblay. Tremblay, who had been working at La Presse+ since 2012, will also act as program director, replacing interim PD Martin Tremblay. Connors has been with Corus/Cogeco for 11 years, and like Hall was one of the people who worked at AM 940 before that. UPDATE (July 18): As expected, Bell Media has announced that Connors is taking over as host of the weekend morning show on CJAD, replacing the retiring Dave Fisher. Connors will also co-host the Home Improvement Show with Jon Eakes and the CJAD 800 Trivia Show. UPDATE (Aug. 6): Connors was interviewed on CTV Montreal about his new job. Natasha Hall, Sarah Bartok and Kim Sullivan in their Beat gear at this year’s St. Patrick’s Parade. I’m thinking this picture might be cursed. Three of The Beat’s female personalities in pretty cool-looking purple coats, and within months they all leave the station. Unlike Sarah Bartok and Kim Sullivan, though, Natasha Hall’s departure is voluntary. She’s leaving for another job, though she wouldn’t say what it is exactly. But she seems pretty excited about it. Hall’s job, doing news and traffic for the morning show, was posted by Cogeco Media, open for only a week and a half, suggesting they may already have someone in mind to fill it. The station declined to comment on Hall’s departure. Cogeco also posted the assistant program director job at The Beat, to replace the also-departing Ken Connors. The job posting doesn’t include any on-air duties. It’s interesting to be hiring a new assistant PD because the program director job is still being filled on an interim basis by Martin Tremblay. UPDATE (July 22): Kim Kieran, currently doing afternoon traffic in addition to promotions work, has won Hall’s former job. She starts Aug. 15. It was a little more than 10 years ago, and Kimberley Sullivan, a kid from Sorel with degrees in psychology and education, wanted to do something that had nothing to do with either of those things: Be a broadcaster. “I wanted to do media, and my father said if you’re not going to do it now, when are you going to do it?” she explained to me in an interview. So she got a job doing traffic reports for the Astral Media radio stations in Montreal, and hosted a show on Virgin Radio. She quit her job, taking a severe pay cut, to follow her dream. Her career later took her to Winnipeg, then Ottawa, and back to Montreal, where three years ago she was hired at 92.5 The Beat, first doing evenings, then co-hosting afternoon drive with Cousin Vinny. That gig ended this month when she was let go due to budget cuts. But rather than spending her days shoving her face in a bucket of Häagen Dazs (though I suppose she could do that too if she wanted), Sullivan is busy promoting her new show on MAtv, about people trying things they’ve never done before but always wanted to. It’s called The Checklist, and its official premiere is tonight at 9:30pm (though the first episode has already aired in other time slots). The 10-episode half-hour show invites a guest from the public (from among submissions sent through social media) to do something interesting, exciting and, above all, that looks good on television. Kim Sullivan jet-boating on the St. Lawrence with participant Michael Saragossi in the first episode of The Checklist. Among those activities: jet boating, glass making, skydiving, riding in a helicopter, and having tea at the Queen Elizabeth Hotel. There are 18 activities in all in those 10 episodes. Sullivan said she intentionally avoided calling the show The Bucket List, partly to get away from the whole death thing (for the record, Sullivan has no plans to die any time soon, and neither do her guests), and partly because the things they’re doing in this show aren’t really “bucket list” items. “Bucket list is Taj Mahal,” she said. But this show is more about getting people to experience things around town they wouldn’t have done otherwise. The Checklist got the green light last July and started filming in August. It was too late for the fall 2015 schedule, when MAtv first launched anglo programming. The plan was to launch the show in January, but Sullivan said that was a bit silly considering how many of these activities are outdoors in the summer. So they waited until May. Because the show is on MAtv, it’s only available to people who subscribe to Videotron cable or Videotron’s Illico Club Unlimited streaming service. It’s uncertain if this project will go beyond these 10 episodes. Sullivan noted that she’s a “media professional”, and it’s unclear if that means she can propose and host a TV show on MAtv and have it considered as “access programming” under the CRTC’s definition. When the CRTC came down against MAtv last year, it discounted some shows hosted by professional media personalities, many of them associated with Videotron parent company Quebecor. The commission’s decision doesn’t give clear guidelines for determining whether the person proposing a show is really from “the community” instead of the industry. Also debuting tonight, half an hour before The Checklist, is Black Wealth Matters, a documentary series about economic matters in the black community. It’s produced by Henri Pardo, who was also behind StartLine, a show about local businesses in food, arts and multimedia. Half a year after being let go from CHOM as part of a larger bloodletting at Bell Media, Rob Kemp has landed at Cogeco’s 92.5 The Beat, where he’ll be in the company of many others he used to work in the same building with. Shaun McMahon, who hosts that show now, will be filling in on other parts of the schedule as everyone takes vacation. But what about after the summer, when there’s less need for vacation fill-in? No word on that. Promotions Director Stéphanie Lagacé says they’re just focused on summer right now. Then again, since they don’t know who the program director is going to be this fall, it makes sense not to think too far ahead.